Another storm. I love lightning and thunder. I fear it, but I love it. It scares me but I don’t wish it away. Here’s why. Lightning and thunder remind me of the mighty power of God. The swift, unpredictable, powerful ferocity of lightning and the loud, attention-grabbing, crashing thunder; it can’t be ignored. It won’t be ignored. The blind hear it, the deaf see it and everyone can feel it in their chest as the earth shakes in response. At our community group a friend shared with us a trial that her family is enduring. It is a long, complicated, seemingly impossible web of the enemy’s handiwork. I cannot fathom the pain, the upset, the heartache they’ve endured. As we prayed for her, we could see her countenance change as her spirit was buoyed by prayer, by partnership with other believers against the enemy who constantly seeks our destruction. I left the meeting encouraged for them and hopeful and filled with faith, but a nagging question: How? How will God accomplish all of this, how will they manage until He does? How can He do this and that and the hundreds of other things that will have to be sorted? How long will they have to wait, and endure this trial? Then a blinding flash of light and a powerful crash of thunder. The thunder shakes my house and deep in my chest I feel it’s intensity. In my spirit I hear the Lord ask, “You question My might?” No, Lord, you can do anything. Anything. This is not too big for You. Job 26:14 "Behold, these are the fringes of His ways; And how faint a word we hear of Him! But His mighty thunder, who can understand?" Who can possibly understand? Certainly not me. 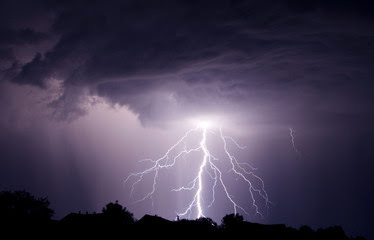 Tonight, though, I’m thankful for thunder and lightning, a physical reminder that God is omnipotent, unpredictable, unfathomable and most of all, loud. He will not be ignored. His creation cannot help but take notice. He will prevail. Lord, please forgive my unbelief. 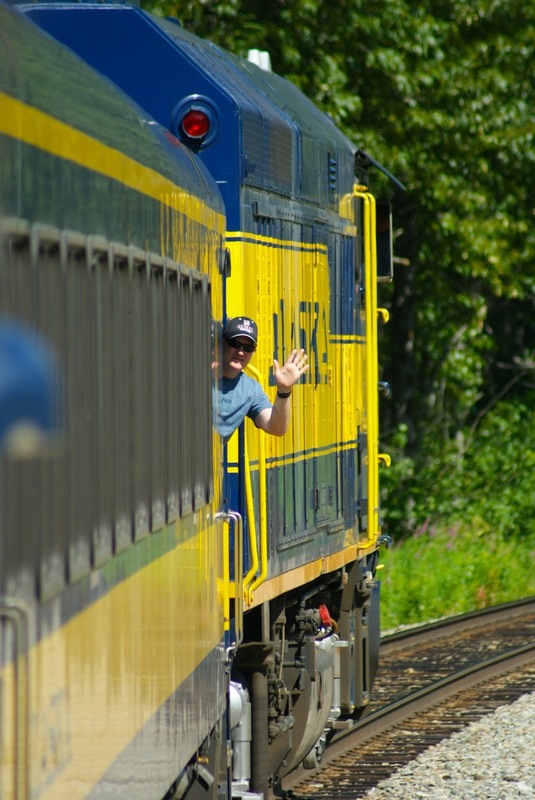 The Alaska Railroad Hurricane Turn Train is one of the few flag-stop trains left in the country. It runs only 4 days a week in the summer and once a month in the winter. The locals use the train for accessing supplies. Tourists use the train for backcountry hiking, fishing, hunting and adventure. We rode the train to join in the fun, and we were not disappointed. Without assigned seats, we were free to wander about the train and met many interesting characters. The turn-around point - from the 300-foot high trestle in Hurricane Gulch. The Hurricane train consisted of two passenger cars, a car with elevated bubble top seating, two engines – each pointed in opposite directions to facilitate the return trip – and the baggage car, a box car equipped with racks, the large doors open on either side. 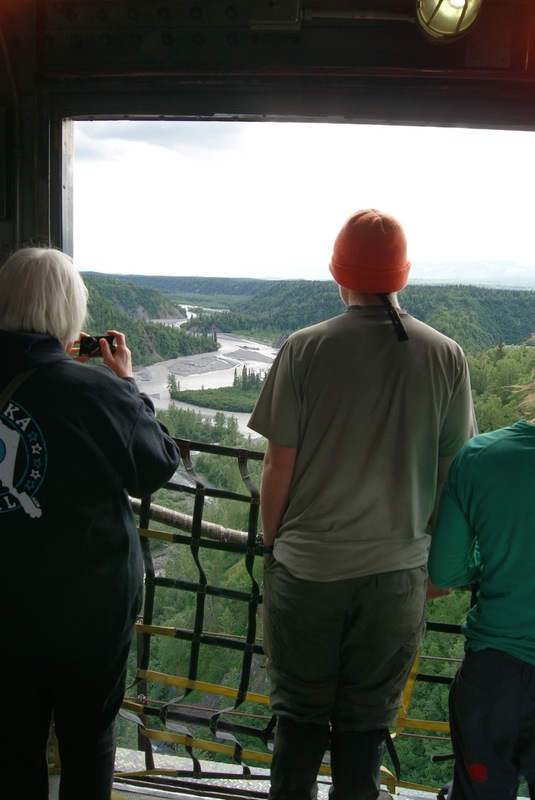 The scenery was incredible as we rode along tracks that followed the route of the Susitna River. Mt. Denali rose from the forested hills, reaching for the blue sunlit sky. Moving from the passenger car to the elevated bubble car, we realized that we much preferred having the wind in our faces. We found our way to the baggage car. The wide-open doors afforded us wonderful views and a gentle breeze. The friendly conductor, sat at a desk. A zip lock bag, with the words US Mail written with a sharpie was taped to the wall. Locals can use the train to send their mail to civilization when they need to. We talked with him about the things he’s seen, about riding the rails and his 40-year career with the railroad. When the train stopped to let off a group of white water rafters. 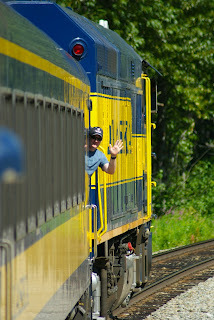 We helped them unload their gear and waved goodbye as the train began to move away from the stop. This is where the action was. We’d found a place to ride out the seven-hour trip. At one of the flag stops, a family gets on board after a fishing trip. We continued on, stopping to let a mother black bear, and her three cubs cross the tracks. 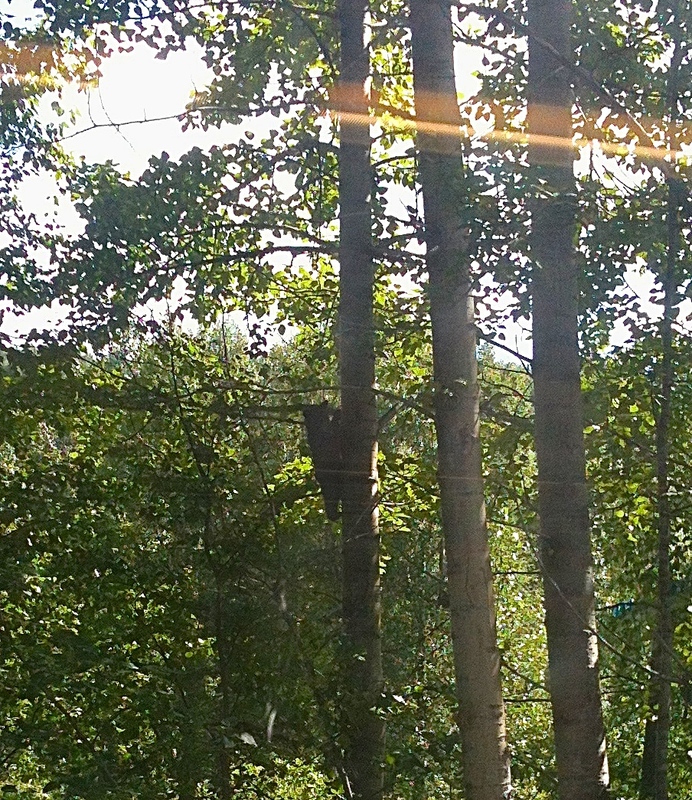 Unsure of the big train, she sent her babies up a tree on the other side, then barked for them to keep following when all was clear. The three adorable balls of black fur scampered down the trees and followed their mother into the forest. What an amazing trip this was turning out to be! 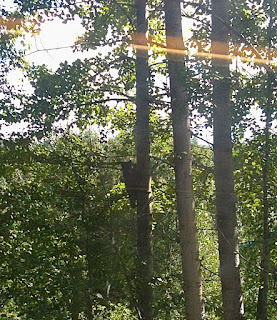 One of the baby bears descending the tree. The train slowed as we approached a group of 15 young men and women between the ages of 16 and 21. They boarded the train with their large packs. They appeared to have been hiking for quite some time. We watched as they threw their packs into the baggage car and then smelled them as they wafted by. Yes, they had been in the Alaska wilderness for a while. Preferring the fragrance of flowers and soap to body odor ripened in the heat of physical activity, rain and wilderness for weeks on end, I suggested to Alex that we avoid them. They made their way to one of the two passenger cars and parked themselves and their stench inside. Later, as we stood in the baggage car, watching the wilderness go by, a few of the teenaged hikers joined us. They reminded me of my kids. Their banter was irresistible. I had to inquire about their adventure. Turns out, they’d been on a month-long wilderness leadership course. Thirty days of intense wilderness training to bring out the best in them, to challenge the limits of their endurance and cause them to bond with strangers from all corners of the world – strangers, now friends, laughing in the baggage car of the Alaska Railroad Hurricane train. One young man in particular, Andy, drew us in. As we asked questions, he was eager to fill us in on details of their adventure. 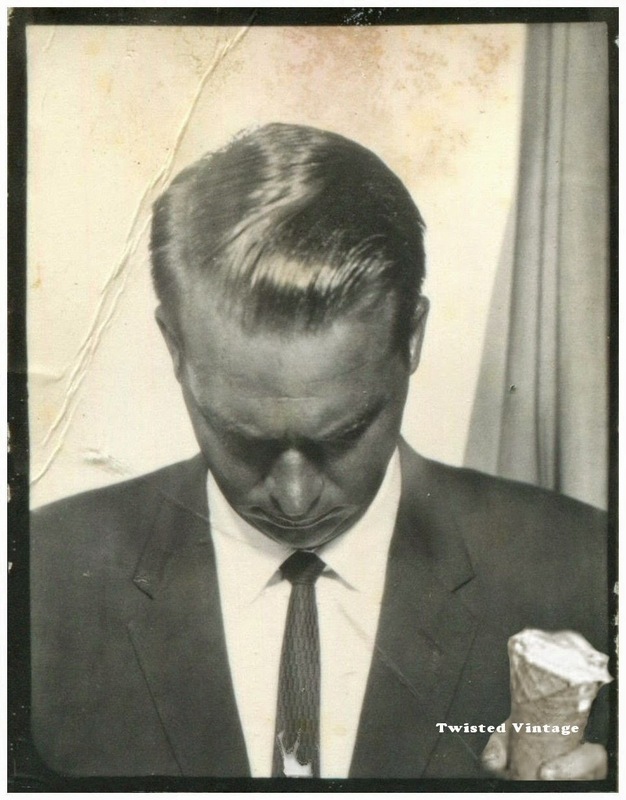 He was an open book, a gushing fountain of anecdotes, longing to share his adventure with us “parent” types. He hadn’t had contact with his family for 30 days. He was eager to ease the pressure of the stories waiting to explode from his memory. He reminded me of my son as he dropped his guard and shared the many things he’d learned in the Alaska wilderness. I asked him to share his most poignant lesson: What will he take away and remember and use for the rest of his life? He thought for a minute and then confessed: “I wrote down fifteen things that I learned.” He disappeared and returned with a small index card on which he’d written fifteen short sentences, each profound, each a nugget of wisdom from the heart of a 17-year-old young man. I wish I’d taken a photo of his list. I’m sure he wouldn’t have minded. His list consisted of things like: First impressions aren’t always accurate. When you feel like quitting, keep going. The steepest mountains have the best views. See what I mean? As our conversation progressed, we discovered that he is a believer. He was going to take what he’d learned and share it with his church…his youth group. Whoever hears his words will be blessed, I have no doubt. We asked him and another boy what they were most looking forward to when they got back to civilization (the Hurricane train is transportation only, no food or drinks, not even water was available on board). They did not hesitate to name the food they’d craved the most. Pizza! One of their leaders had promised ice cream when they arrived in Talkeetna and that was in the forefront of their minds as well. Food. Teenage boys. It was a stupid question…of course that’s what they were looking forward to! Andy pulled out his index card again, turned it over and shared the list of foods he’s been craving. We laughed, and as I listened to their stories, the mother in me longed to produce a pizza, some juicy hamburgers and milkshakes…I had an overwhelming urge to feed them. Eventually, Andy and the other boy left the baggage car and sat with their friends in one of the two passenger cars. When they left, I realized that their odor hadn’t been all that offensive…perhaps because we were standing in the breeze of the open door of the baggage car, or perhaps the sweet fragrance of enthusiasm and joy had overwhelmed the stench of a month-long adventure that had changed the teenaged boys into men. The hikers walking into Talkeetna for the longed-for ice cream! I have a massive vintage photo collection. By massive, I mean worrisome. I cannot resist a good vintage photo. I prefer black and white, but old hand-colored photos are irresistible. Snapshots, photobooth and portraits gone wrong are my weakness. People being who they are...showing their personality...being silly...caught with their guard down. How can these two people be attracted to each other? OH my, that's so sad...usually in a funny way. If I'm inspired, I buy it. I do have spending limits, but I've been known to pay the price if the photo is good enough. My photo collection has inspired many, many stories. I love to write what I think is happening in the photo...or maybe the story of how a couple met...or perhaps the story of how the photo transpired. Sometimes, the person in the photo inspires a character. All of my writing group ladies (in my novel - The Grace Writers) were inspired by vintage photographs.